Today I presented a webinar about "How to Build an Interactive Learning Environment" and presenting the content really tied together a lot of my thoughts, teaching experiments and recent readings. The presentation, enhanced with research results, is available on Slideshare, with my preferred title "Learning in the Social Web" if you'd like to see it. Effectively building online community is a topic receiving quite a bit of attention lately and online instructors who are focused on developing and facilitating quality, relevant learning experiences should be part of this dialogue. 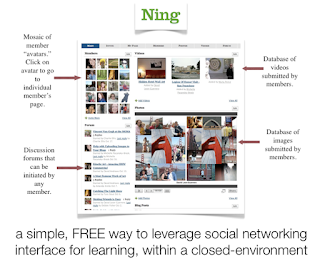 Community building has been an integral element in online learning research, guided by the work of many including Palloff and Pratt (1999, 2005), and Swan and Shea (2005), and Yuen (2003). Within the many flavors of theories and importance of fostering community is the embedded idea that learning online is learning in physical isolation and void of socialization, unless collaboration, interactivity and social presence are effectively integrated into the design of the course. Research has shown that the feeling of being isolated is a factor that contributes to the lower retention rates in online classes (Galusha, 1997; Hara & Khling 1999; Kubala, 1998; Soles & Moller, 2001). Now as we sit in the corridor of the 21st century, we need not look too far for community building powerhouse tools that offer educators and students the opportunity to share and collaborate through video and voice. 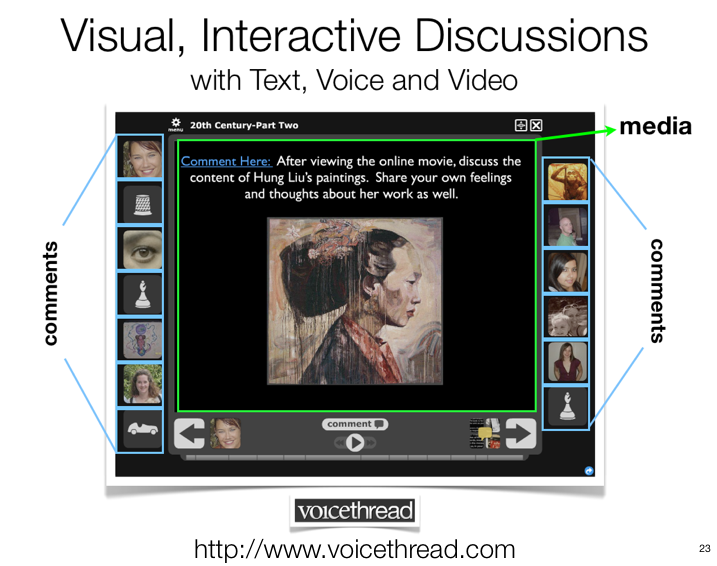 Much of the research I've shared in past posts about how the use of VoiceThread (a web 2.0 tool that integrates options for leaving text, voice or video comments) in online classes increases community. Web 2.0 is our opportunity to explore these new philosophies in our teaching. Many other educators are exploring web 2.0 tools as a more interactive, participatory way to share content and engage students in online interactions. One of my favorite recently literature contributions on this topic is a white paper shared by Virginia Commonwealt University's Center for Teaching Excellence, From Content to Community: [Re]Thinking the Transition to Online Teaching and Learning. The concept of "rethinking" a course redesign to deliver it effectively for online learning, suggests that we have now moved into a new phase of online pedagogy, one that engages the social wonders of the web -- where are students are actively engaged when they aren't in a formal online class. While new literature about online teaching and learning is encouraging applications of social media into formal learning, unfortunately, few LMSs currently integrate dynamic video and audio discussion tools into their basic toolkits nor do they offer opportunities for students to generate multimedia content. And this is a major reason that dynamic social presence in online classes isn't mainstream. Many faculty adamantly defend the ability of text-based interactions to facilitate social presence but many studies today are proving that audio and video simply outperforms text in this area (not really a surprise, is it?). In the past week, a terrific article has been shared in many venues about the work of Douglas E. Hersh, Dean of Educational Programs and Technology at Santa Barbara City College (SBCC). Hersh has developed a customized version of Moodle that integrates Skype for student-student and instructor-student interactions. Skype is a free web 2.0 tool that enables free video and voice and instant messaging communications between users anywhere in the world. The Moodle learning environment also providees students with "voice boards" in which they discuss topics. Students can also anonymously rank learning experiences, providing a quick and effective way for instructors to obtain feedback throughout a course. Hersh embarked upon a study at SBCC that sought to investigate whether increasing the "Human Element" in onlne learning through the creative learning environment in their customized Moodle version, would result in students feeling more connected to their online learning environment and, in turn, improve the low student satisfaction, low levels of student achievement and high attrition rates (that are typically 10-20% higher than face to face classes). The results? Class completion rates increased by nearly 10 and student satisfaction and student mean grade point averages also increased by a similar number. As noted in the CCC TechEdge article, "A 10 percent increase in class completion reduces the 10-20 percent greater chance of attrition for online learners and begins to even the playing field between traditional classes versus online classes." Now, here is what we all need to take away from this. First, while Hersh's model doesn't explicitly reference "community building," I would argue that by enhancing social presence of the instructor and students through video and voice, and providing collaborative activities in the course design, these classes are triggering many essential elements of community building. The use of audio feedback for increasing community was explore by Ice, Curtis, Phillips and Wells (2007) and my own students enforced these results through their 2008 feedback about using VoiceThread. As I've shared, 94% strongly agreed or agreed that hearing their online instructor’s voice through VoiceThread’s audio comment feature increased their sense that she was actively present in their learning experience (versus text-only feedback) and 98% felt this way about video comments. Students feel more distanced through text-only communications and video and audio reduces this feeling of isolation, resulting in greater retention and increased motivation to succeed. So, why aren't audio and video integrated more regularly into online learning? My hypothesis is that online instructors rely upon the toolkit within their LMS to teach -- just as I did in my first two years of online teaching. Few faculty work at institutions that will take an innovative approach, like Hersh did, and craft a specialized LMS. That, I'd put money on -- although I long to see the day higher ed puts an emphasis on innovation in instruction. We need more thinkers and doers like Hersh. But do not fret my friends! We are amidst a world that has been transformed by web 2.0! 95% of college age students (18-24) now use social networking and 70% do so every single day! (ECAR, 2009) Half of our students share (not access) videos on YouTube and more than a third report contributing to blogs and wikis. Times are changing and these are tools we need to be mastering and using as tools to teach our "distanced" students. The truth of the matter is that it's EASY to record a video in YouTube via your webcam, copy the embed code and paste it into an LMS. I am always amazed at how many professors have no idea how to do this in Blackboard or Moodle (the only two LMSs I've really had experience with). It's NOT difficult and it WILL change your students connection to the class. 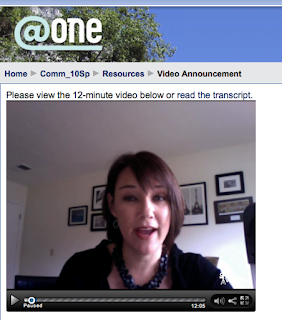 Here is a simple screenshot of a video I recorded using my webcam in Viddler.com and simply pasted the embed code into a basic Moodle version (nothing customized here). 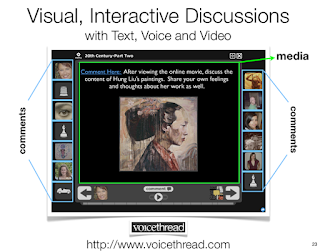 Additionally, VoiceThread and Ning are simple ways to integrate collaborative activities that offer students opportunities to connect with each other through video and voice and also see pictures of each other. A recent survey I conducted with Michelle Macfarlane and Jennifer Molina demonstrated that 90% of our online students reported that seeing pictures of their fellow classmates helped them feel more connected to the class discussions. Let's do this...web 2.0 is a road towards empowering faculty to integrate community building tools into a students' online learning experience. The area that we need to work on, however, is accessibility. We, all of us in education, need to voice our concerns about tools that are not compliant with 508 regulations. We are not there yet. But, I believe, that if we engage with the tools now and integrate them thoughtfully and appropriately and share our expectations with web 2.0 developers (through blogs, Twitter, writing to the developers themselves) then things will change. Very nicely outlined, and I like the different models you proposed for how to pull this off and what tools to use. Perhaps you've already heard of Bloomfire (which I represent), but if you haven't, you may like how our platform merges multiple tools together. 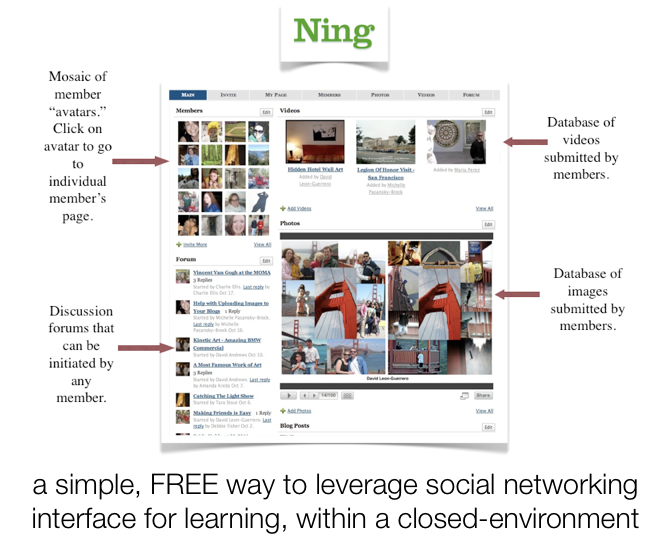 We built our platform to be a collaborative learning platform from the ground up.